3rd January 2011 Added photographs and report to this page. The Great Baddow Research Centre - near Chelmsford as seen in 1993. 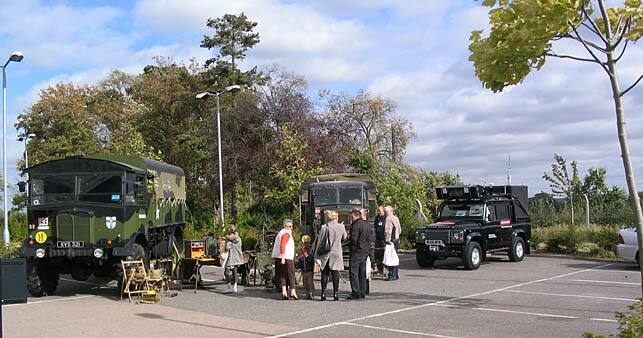 The mast in the background is the only fully-intact standing Chain Home Radar Mast in UK. 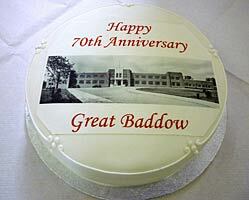 Click here to read more about the Great Baddow Mast. 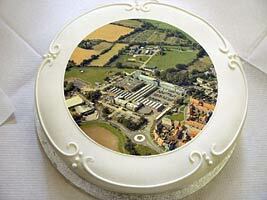 Photographs by kind permission of BAE Systems. 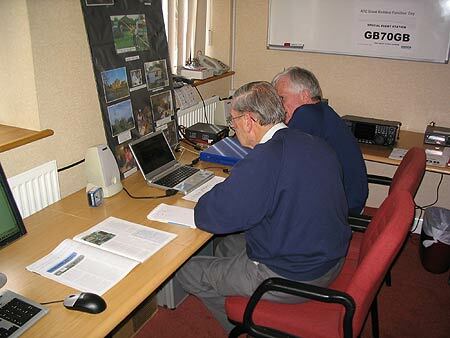 GB70GB was the Special Special-Event callsign issued by Ofcom-UK for the 70th anniversary of the opening of the Marconi Research Centre at Great Baddow. It was later on home to famous staff including Spycatcher author (Peter Wright) and Chris Cockrell (Hovercraft inventor). Front of the Headquarters building in the summer of 1939. Opened just before the outbreak of WWII its 47 acres were immediately camouflaged by nets and painted roads to protect it against air raids (unlike the Marconi factory at New Street in central Chelmsford which did get bombed) where it was home to strategic wartime magnetron and quartz crystal production. 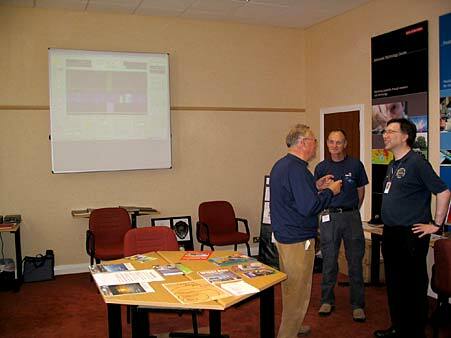 Pre-registered Visitors on 3rd October saw a series of exhibits on the Great Baddow history and technology from turn of the century Marconi heritage right up to present day innovations at what is now known as BAE Systems Advanced Technology Centre. 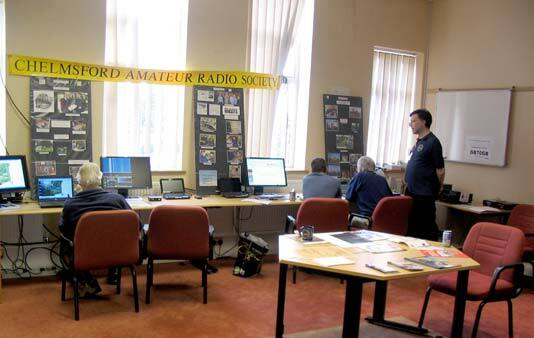 CARS were pleased to be invited to support the Event and to put on display of a collection of operational Morse Keys and a working HF Amateur Radio Station using SDRs. 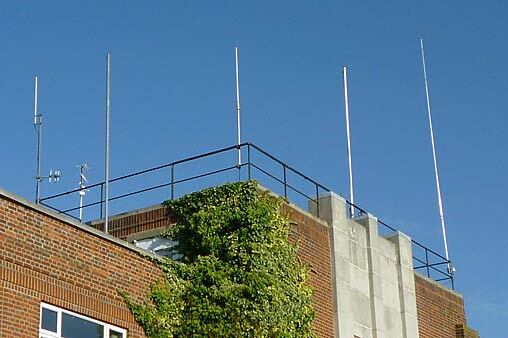 with the helical VHF Weather Satellite Antenna (2nd from left). 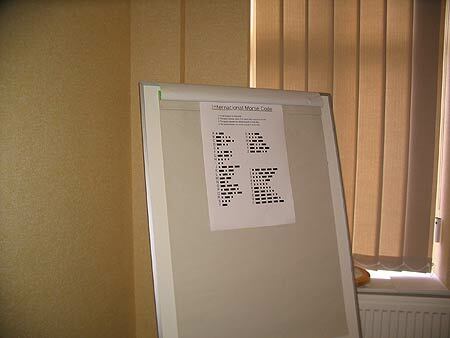 Notice board with the Morse Code for visitors. 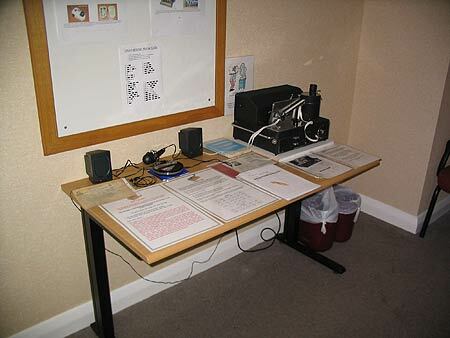 Click here to read the Morse Code displayed on the board. It is a PDF File, of only 60kBytes. faster than it could be sent in Morse Code. Morse tape punch by Colin, G0TRM. 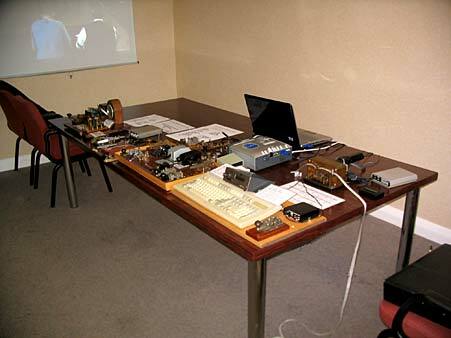 The complete table of Morse Keys and Tape Reader by Colin, G0TRM. faster by Morse Code than Texting on a Mobile Phone. an ex Naval Radio Operator who is currently ATC's Contracts Manager. 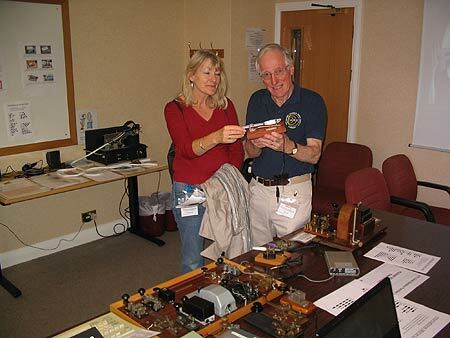 Colin showing a visitor a Morse Key he had constructed out of a knife and fork. 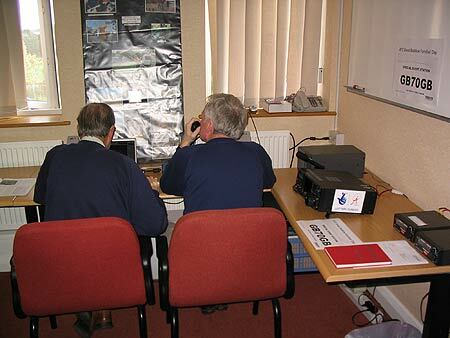 Ken Writtle, G7RFT, (left) talking to Martyn, G1EFL & Murray, G6JYB who arranged the Amateur Radio Room. The screen is showing the radio spectrum, live, taken from the CARS Flex 3000 Transceiver nearby. 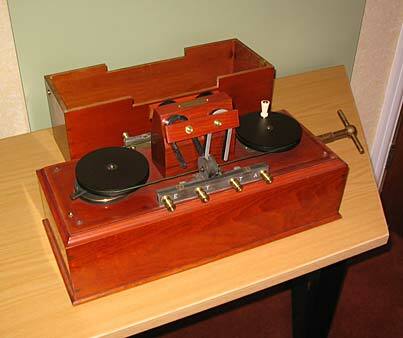 Marconi Magnetic Detector from between the period 1902 and 1914. Click here to read a detailed explaination of how the Magnetic Detector works. 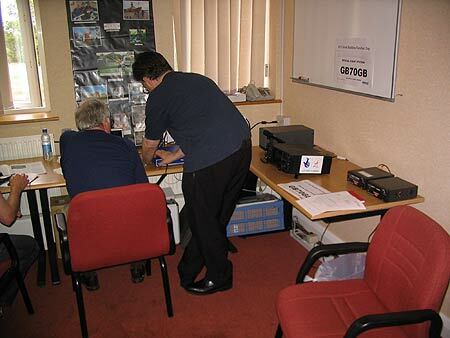 for the Flex 3000 Transceiver with John Yates, G1UZD behind him. 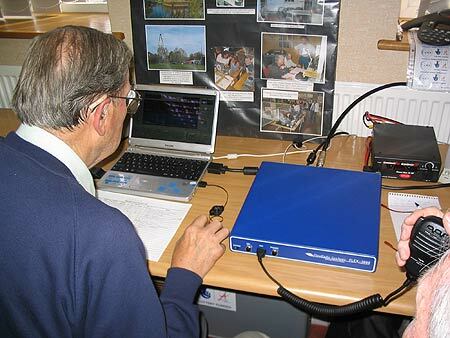 Brian with the Flex 3000 SDR Transceiver. by CARS with support from the "Awards for All" lottery grant. BAE Engineer, Ramsey Faragher texting a Radio Amateur who was answering on air to John, G1UZD. hand screen displays the contact in progess. Enter the Amateur Radio Call-sign in the "Search area" - click "Return"
most Governments in the World. 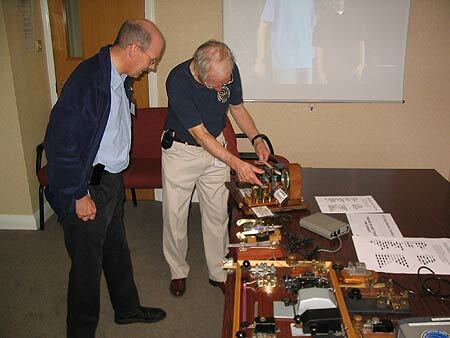 Visitor David Bolwell, ex G3JCM (left) looking at a current weather display from a NOAA satellite. 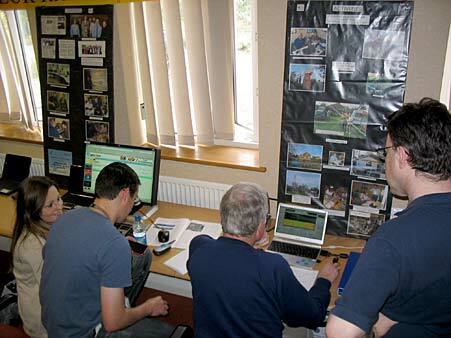 The screen to his right is displaying the radio spectrum from the CARS SDR-IQ Receiver. Ramsey, John Yates and Murray are to the right. 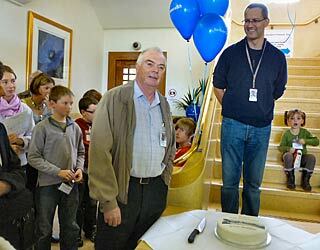 Technology Director, with his young Daughter looking on from the stairs. 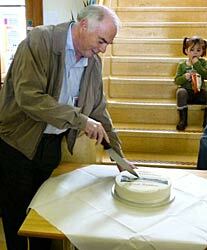 Bob Humphrey, cutting the first cake. 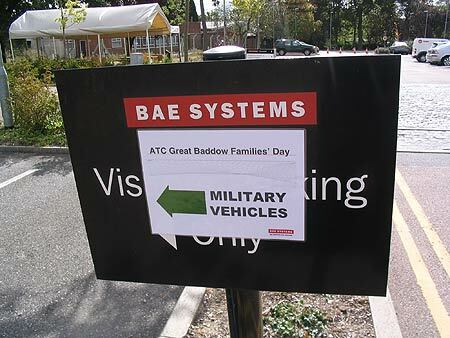 Thanks to BAE Systems for the hospitality in displaying this historic event. Thanks also for the effort and kind help especially to those persons behind the scenes who are so necessary to the success of such an event.